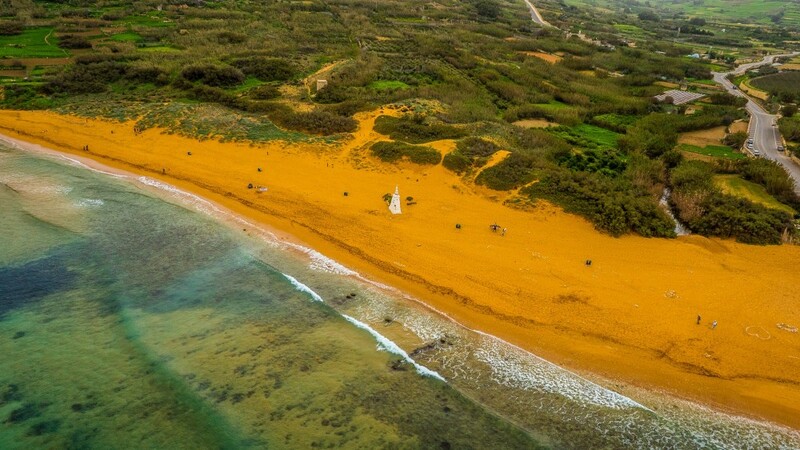 Ir-Ramla il-Ħamra, translating into Red Sand, is the largest beach on the island. 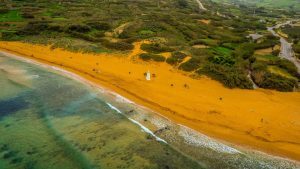 This natural beach is characterized by natural red sand dunes running along the 500m stretch of the beach. Ramla Bay is located a t the bottom of a rich and fertile valley on the northern coast of the island. With the village of Xagħra overlooking this valley, terraced fields and rubble walls give a traditional touch to the valley. When viewed from the high ridges surrounding the valley, Ramla Bay gets a quilt-like appearance . The beach is surrounded with rich historical treasures. Roman remains lie beneath the sand and the famous Calypso Cave overlooks the western side of the beach. Bus service runs regularly a couple of metres away from Maria Giovanna Guesthouse, however a hiking trail is located East along the North Coast of the island. This trail goes through the natural heritage of the island with a large number of traditionally farmed fields. Panoramic views of the Mediterranean Sea and the northern part of the island are present throughout the hike. The Cittadella, also kno wn as the Citadel, in Victoria Gozo, is a combination of a medieval castle and an early modern gunpowder fortress. The northern walls retain a largely medieval form and its southern walls date back to the 17th century reconstruction. The Citadel has been included on Malta’s tentative list of UNESCO World Heritage Sites since 1998. The fort was recently renovated offering a walk along the bastions. This is rewarded with a breathtaking 360-degree panorama of Gozo. Hills and valleys, villages and churches and the view right across the sea to Malta dominate the picturesque scenery. One can also find a number of museums; The Cathedral Museum, The Museum of Archaeology, The Folklore Museum, The Gozo Nature Museum, The Old Prison, The Old Gunpowder Magazine, The Grain Silos, The Battery and the World War II Shelter. From Maria’s BnB, one can start a hike to wards the small fishing village of Marsalforn, exposing oneself to picturesque scenery of the Ghasri Fjord and Salt Pans. Ghasri Fjord is a natural wonder, offering a secluded small beach at the bottom of the valley. This offers crystal clear water with the valley walls on both sides. 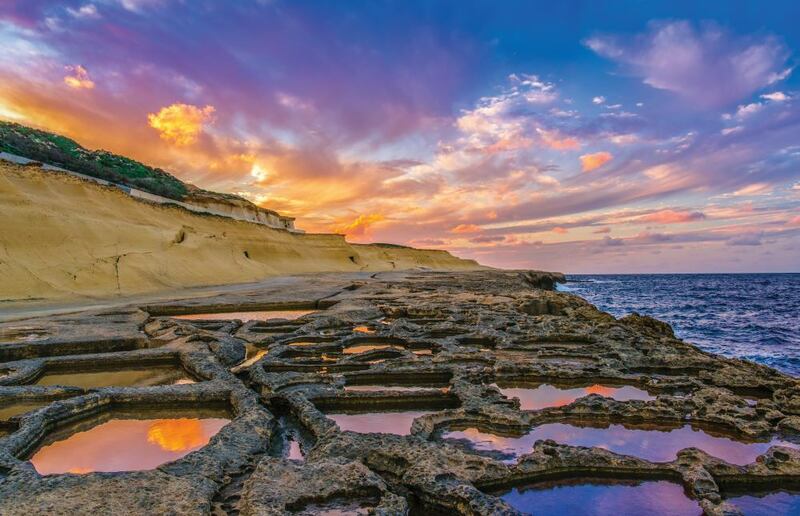 Further on is the north coast of Gozo, characterized by a chequerboard of rock-cut salt pans protruding into the sea. These 350-year-old salt pans, stretch about 3 km along the coast, are more than just scenic. They are part of the centuries-old Gozitan tradition of Sea-Salt production that has been passed down within certain families for many generations. During the summer months, locals scrape up the crystals of salt. The salt is then stored and processed in the caves carved into the coastal rock. This hike is estimated to take approximately 1 hour 15 minutes arriving at Marsalforn, where one finds a beach as well as plenty of bars and restaurants. In Marsalforn one finds our first launched property, Maria Giovanna Guesthouse. Frequent buses stop at the bus shelter directly to the main terminus in Victoria.